A mathematical framework is developed to model the kinematics of surface growth for objects that can be generated by evolving a curve in space, such as seashells and horns. Growth is dictated by a growth velocity vector field defined at every point on a generating curve. A local orthonormal basis is attached to each point of the generating curve and the velocity field is given in terms of the local coordinate directions, leading to a fully local and elegant mathematical structure. 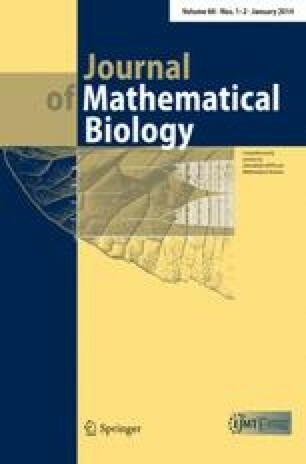 Several examples of increasing complexity are provided, and we demonstrate how biologically relevant structures such as logarithmic shells and horns emerge as analytical solutions of the kinematics equations with a small number of parameters that can be linked to the underlying growth process. Direct access to cell tracks and local orientation enables for connections to be made to the underlying growth process. This publication is based on work supported by Award No. KUK-C1-013-04, made by King Abdullah University of Science and Technology (KAUST), and based in part upon work supported by the National Science Foundation under grant DMS-0907773 (AG). AG is a Wolfson/Royal Society Merit Award Holder.